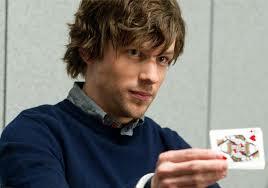 New York-born actor, Jesse Eisenberg, 29, stars in the upcoming thriller, Now You See Me. A staple in Hollywood since his breakout role in the Academy award-winning drama, The Social Network, he’s been acting since childhood reportedly due to feelings of isolation at school and his inability to fit in with his peers. He’s described his childhood as happy and stable, despite an alleged obsessive-compulsive disorder. His mother worked as a clown at children’s parties and his father was employed at a hospital before becoming a college professor. Very little is known about his personal life, other than he has a fondness for cats and is associated with Farm Sanctuary, an organization to help animals. In his upcoming role he plays a magician alongside Isla Fisher and Woody Harrelson. How was it to play a magician? Did you want to become a magician when you were younger? I always felt kind of guilty doing magic when I was younger because I don’t like keeping secrets. Actually, when I was working on this movie with a magic consultant, David Kwong, who is also my magic mentor we would perform for other cast and the crew and after David walked away after the trick I would immediately go up to them and reveal how we did it because I felt too strange. I liked that we were acting as a magician and for me it was a safer context that I wasn’t alienating anybody. Do you feel that magic brings hope to people or it’s more deceitful sometimes? In my little experience with magic through this movie most people really enjoy it. And they like that they don’t know what it was and it gives them a sense of excitement to know that there’s something mysterious happening in the world. I guess it could be dangerous if you’re telling somebody that this is real and there are ghosts and your life is being manipulated by secret things I guess it could be dangerous. But I think that the general understanding with magic is that this is something that is not real but really amazing and it’s more fun not to know than to know. 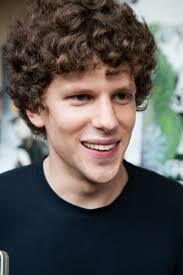 There is a correlation between Mark Zuckerberg from The Social Network and this guy from Now You See Me. They’re both incredibly confident, a little alienating, almost isolationists. Did you see the similarities between those two parts in two different movies? I guess when somebody is doing something that they’re great at and surrounded by people who they consider being less good at it. Yeah I guess it kind of breeds a certain arrogance and that’s fun for me to do because I feel less comfortable acting that way personally so it’s kind of like fun to play that. Are you confident as an actor? Retroactively or retrospectively. What is happening though is that I feel really nervous and not sure and then afterwards I will feel well and will think to myself that it all went well and I accomplished a little bit of what I wanted to accomplish, but I just finished a play in New York and we would do a play at 8 pm every night and the whole day I was like wreck. And then there were two hours after the play that I felt good for the first time because the play was over any it went well, it inevitably went well but I’d always assume for the whole day that tonight would be the night when everything will be screwed up and I would look like an idiot. So usually in a retrospective way I feel ok. Your life must be a hell if you feel good only for two hours out of the day? Yeah it is except that sometimes we would also do a matinee so my day was completely lost. (laughter). Did you get Woody Harrelson involved in this movie because you both worked on Zombieland? Not necessarily. I think that the director said that they were thinking about casting Woody in this other role and he asked me what I thought because I signed for the movie first. I immediately thought that it would be amazing and they said that they thought so too. And then Woody and I spoke and we thought that it was a great idea because our characters’ dynamic were different in this one than in Zombieland. It’s more explicitly comedic and this characters dynamic in more competitive, they’re rivals, and so it seemed like a different enough dynamic to not overlap with the other movie I guess. Have you seen the TV version of that? No I haven’t. The guys who wrote that movie ended up turning it into TV series and then the TV series never got made so they ended up turning it back into the movie so I think there was enough script material to make it into TV show. When you look into those characters in both movies they are being manipulated in a way. There’s this whole Robin Hood thing of giving back but have they been hypnotized in a way? Yeah. I think that what my character becomes frustrated with over the course of the movie because this is the guy who always feels in control and always has power over his audience and this is the way he does business. 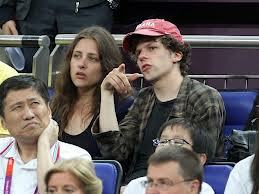 And then as the movie unfolds he starts realizing that somebody else is controlling everything. What he’s doing is really irritating to him. And then I guess at the end of the movie he realizes what’s been happening all that time and if my character realized that at the beginning of the movie he would have never signed on to it. Have you ever felt manipulated? My last interview (laughter). I feel like all the time. I see a therapist and he tells me not to call my mother. But I don’t know…. I would talk to anyone who would listen to me. Is it a fun part of your job to learn different skill sets? Yes it’s great but it’s also short-lived. The day when we finished shooting this movie I had to fly to England to start another movie and I didn’t have time to carry on this wonderful skill that started to develop because I had to learn something else for that movie. So it’s fun but it’s short-lived and it becomes kind of like enjoyable treats. What did you learn skill-wise from The Social Network? I took some fencing classes because that guy I was playing he was like a fencer in high school or college so I took some fencing classes and I thought it was an interesting skill but it has no relevance in the movie explicitly because the guy is not fencing or anything but it kind of helped me to get into the posture of the character so that was interesting but then the movie ends and you stop fencing which is probably for the best because who needs to fence. What’s the movie you shot in England? It’s called The Double and it’s about a guy whose life is overtaken by his doppelganger so I play this meek businessman whose life is overtaken by the other guy – who I also play – who is this brash guy who everybody loves for no reason and it takes place in this dystopian world that’s based on Dostoyevsky novella The Double and is directed by this English guy Richard Ayoade. If you’d have a chance to steal something and get away with it, what would it be? A heart of…. no, maybe another organ, like a kidney, just to have it on hand in case something goes wrong with my own one. Just keep it in a jar just in case. That would be the great irony of my theft – steal the wrong organ and keep in a jar for 20 years. This is almost like a ‘get even’ story. Do you have someone you would like to get even with? It would probably work in a situation of when I was younger and someone who was awful to me and as soon as I’d get opportunity to ruin this person’s life, I would do it. And I did get the opportunity because they were interviewing for a job that I was already doing and I was too nervous to say that I hate that person so I didn’t ruin this person’s life nor did the guy get the job. But anyway it’s kind of an ugly feeling to hold on to but I did nonetheless. How was it working with Michael Caine who’s an incredible storyteller? He’s really funny and self-effacing really, kind of like a modest funny guy. He actually produced the movie The Double so I saw him in England as well. And he’s just this amazingly funny humble guy. And it was a little odd because my character is so obnoxious to him and it was a little strange for me to feel this great sense of reverence and then when the camera is on I have to condescend to him so much. So that was a bit odd for me. But that’s one of the fun things you get to do as an actor is to act in a way that would be totally inappropriate in any other context. Are you intimidated by such people as Michael Caine who has such body of work? I’m intimidated by most people generally irrespective of their knighthood. Were you able to learn anything from him as an actor? It’s really hard to say, to articulate what you learn from other actors because it’s such a strange skill set that it doesn’t translate well to try and explain it. I just finished the play and I was sharing the stage with Vanessa Redgrave and so I was with her for the last five months every day and like you learn a lot but it’s hard to articulate. I was seeing how she paces herself in front of the audience – our play was dramatic but it was also funny – so I saw the way she was pacing herself for an audience and if they’re laughing a lot I see the way she’d like hold back instead of maybe what I would instinctively do which is to go after a laugh and kind of ride it in some way which is not very responsible thing to do because it’s not right for the story. So you learn stuff like that but more kind of by the process of osmosis, by more just being around than by taking notes. There’s a certain New York sensibility about you. You grew up and live there. When you come to New Orleans to film a movie what does that lend to you? How much do you soak up in the local culture? That’s a really good question. When you go away on location to your movie I really feel like where you are affects the experience so much. And shooting in New Orleans was so perfect because this city is so full of life and magic and kind of performers and food. Everybody feels like they’re performing in some way, people on the street and every casual interaction is entertaining. And that’s what this movie is. All these casual interactions have this like built-in intensity about them because the characters are performing and they’re doing these intense shows and so this city was so perfect to do this movie. We also sot in Las Vegas and Paris for few days but it still felt like a New Orleans movie. Can you do magic tricks now? 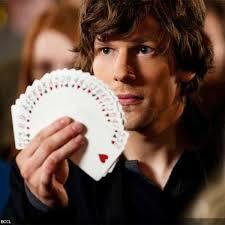 I do a very unimpressive card tricks. I think I know how the tricks are done; I probably know most unimpressive parts of the most impressive tricks. Do you think you can use it to impress a girl or someone else? I tried it on everybody but it doesn’t seem to work. Is acting a trick, in a way? Yeah, the difference with acting is that there’s a very clear understanding that what you’re doing is not real and with magic there’s kind of a less that understanding; there’s more of a grey area that you’re performing in. The relationship between the audience and the performer is very different when you’re doing magic because there’s a grey area of understanding – is it real or not? Whereas, when you’re acting in a play or movie everybody pretty much understands that it’s fiction and not real.